After bagging a cheap fare flight from Bengaluru to Raipur, I got busy hunting for return option. As usual, I hooked on to my usual OTAs - I found a great fare on Cleartrip (my favorite among the lot). The cheapest option for that day was on Jet Airways, with a flight change at Mumbai. The second cheaper option was IndiGo, the timings of which weren't comfortable for me. I decided to check if these fares existed on the Jet Airways website as well. The website had some interesting stuff for me! While I was generally unhappy about the delay, I was secretly happy about the delay, since my wait at Mumbai would be somewhat shortened (not much, just a few minutes). Twenty four hours before my departure from Raipur, I try doing a web check-in. The mobile app is quite slow, it kept swirling for a long before each page. It let me select seats for the two flights and gave a confirmation that I had been checked in. Later, in the page where it asked for my email id (I wonder why should they ask that, since my app is anyway linked to an email id, so is my Frequent flyer membership, and the booking database would surely have all my contact details), there was a message that boarding passes for "one or more" sectors in my booking cannot be issued, and I must contact their airport counter. Never mind. I would anyway go to the check-in counter to drop my bags, and I prefer the airline issued boarding passes, than taking a printout myself! The convention was over by afternoon, and I got some time to rest at my hotel room. I needed to rest since I'd hardly sleep that night, and I hadn't slept properly the previous nights as well. But, then, I was excited, like everytime before a flight, and I couldn't sleep. Another delegate at the convention was also taking the same flight and we had decided to share a cab, although I secretly wished to take a bus. But, I did not feel it would be a great idea to take a bus with baggage, especially during evening hours. We finally opted to hire a cab, and I booked one through the Ola app. First, there was very poor availability, and, second, the driver refused to come down for an Ola booking. He wanted a private booking, and asked a fare slightly more than what was estimated by Ola. I wanted a cab, and accepted. The cab driver turned up in 10 minutes. The maniac at the wheels drove fast, overtook zig-zag and honked as if he was playing a keyboard. The car was in fairly good shape and rode fairly well. He had some near misses on the way, and was engage on the phone for most of the time as he neared Raipur. It took a lot of time for me to understand the geography of the place. He dropped us at the airport by around 1812hrs. 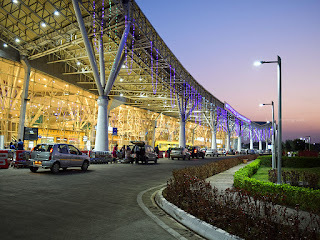 The airport looked amazing - too good for a city like Raipur. The terminal was well lit and decorated. Although the design was the typical oval shaped, ACP & Glass structure, the lighting and the ambiance gave a special feel to the airport. I took some time to enjoy the airport before entering the terminal a few minutes later. Security personnel at each point were a little too strict - they checked tickets meticulously before letting passengers into the terminal. There was another checkpoint just before baggage scan. Baggage scan was done by 1818hrs and I headed to the check-in counters. 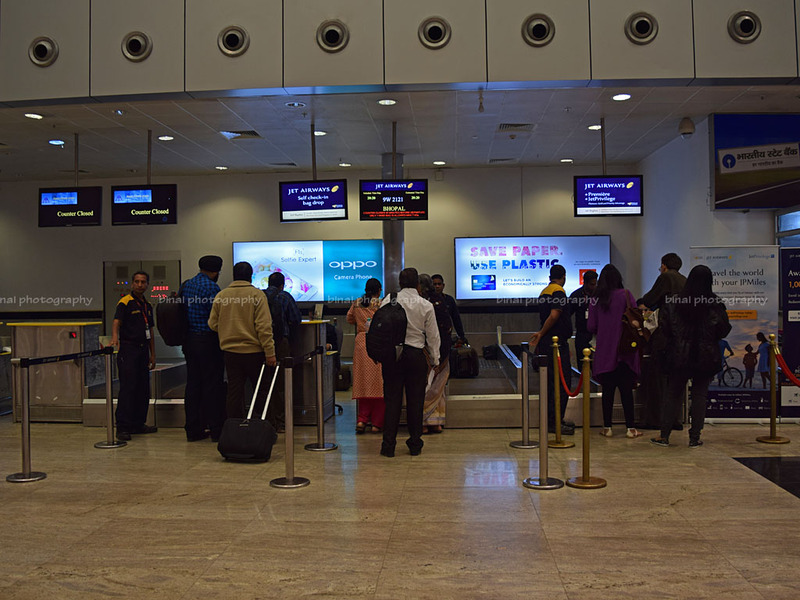 Check-in counters are an eye-sore at most AAI airports - they are located in congested places, with terrible looking desks and displays. 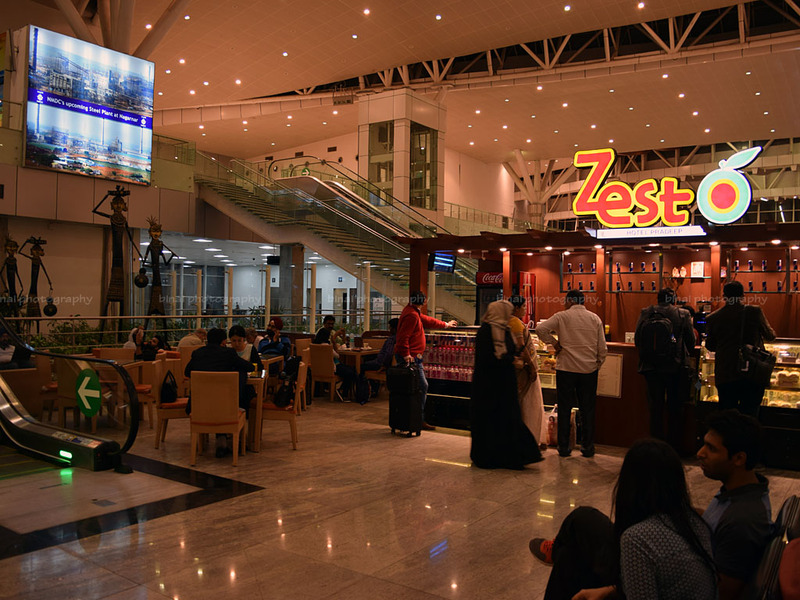 The staff at the counter were very helpful - I was allowed to use the business class check-in counters and the entire process was fuss free. 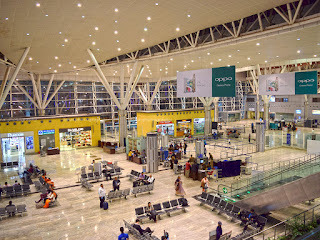 They confirmed if I wanted to check-in my baggage through to Bengaluru, or if I wanted my bags at Mumbai - I checked it in through to Bengaluru. I was unable to do an online check-in for my Mumbai-Bengaluru sector, but was allowed to select a seat. The counter staff issued boarding passes for both the sectors, and my seat selection was retained as well. I got my boarding passes by 1820hrs. Check-in counters of Jet Airways.. The next stop was Security check. My bag was pulled up for rescreening since it had "too many electronic gadgets" - basically my mobile phones and chargers. While I appreciate their concern of "too many electronic gadgets", the phones were inside the bag only because I was insisted to put them inside! I was done with security check by 1828hrs and moved to the Security Hold Area. I was quite hungry, and hoped to have some food from the Lounge offered as part of my Ola Select membership. 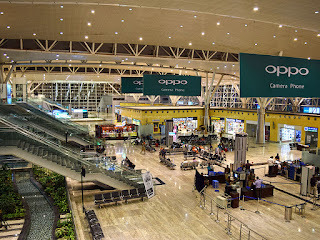 I couldn't find any lounges in the airport and walked throughout the airport in the hope of finding the lounge mentioned on the Ola website. I finally zero in on an outlet that bore the same name as the lounge mentioned on the website - a quick enquiry at the counter confirmed that I was actually at the correct lounge. The access procedure took a lot of time. I had the option of choosing any item on the menu. Thats the security check area.. 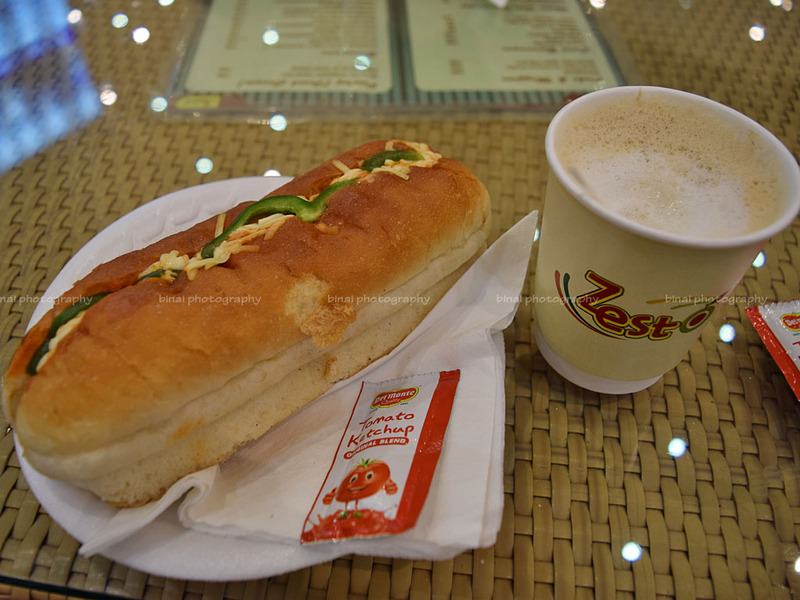 I picked up a Paneer Hotdog and a cup of Cappuccino. The hotdog was served hot. Although it was called a hot dog, it was a normal sandwich with a Paneer filling and some vegetables. The Cappuccino was the typical Cafe Coffee Day stuff. The lounge had minimal seating facilities, which were full. After finishing the snack, I headed out in search of a charging point to charge my phones - but surprisingly, there were none! I found just one charging port, which did not have the option to use my own charger. 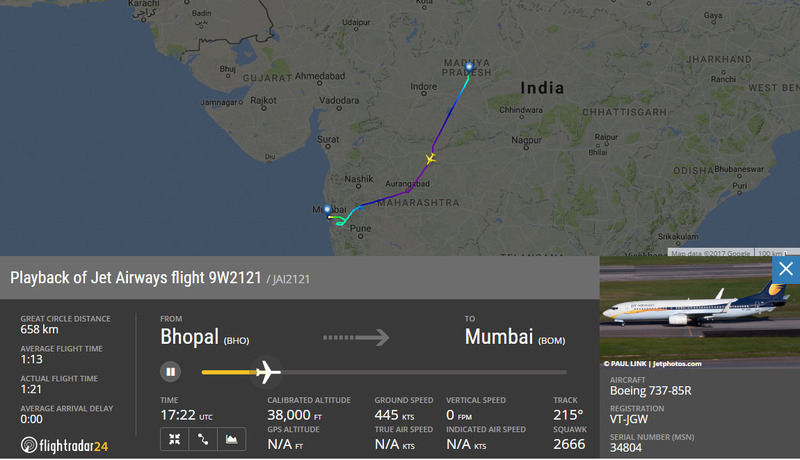 In the meantime, I logged on to Flightradar24 to track the aircraft, which was by now flying in from Mumbai to Raipur. It was VT-JGW, a Boeing 737-85R (WL) delivered to Jet Airways in June 2007, for me that day. There was a line-up of departures, mainly of IndiGo. IndiGo staffers were walking around the airport calling out for passengers flying out by IndiGo flights leaving then. The Paneer Hotdog and Cappuccino that I picked up.. Golf Whiskey touched down at 1954hrs. The first boarding call was made at 2008hrs, and strict zone-wise boarding was enforced. Along with the boarding call, an announcement was made that the aircraft had JetScreen, Jet Airway's onboard WiFi based entertainment system, and that passengers should download the AirTime app before passengers boarded the aircraft. I just did that and remained seated till the tail end of the boarding queue was seen. 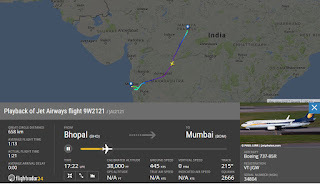 The aircraft flies a triangular route - Mumbai-Raipur-Bhopal-Mumbai, with the flight number 9W2121 throughout. 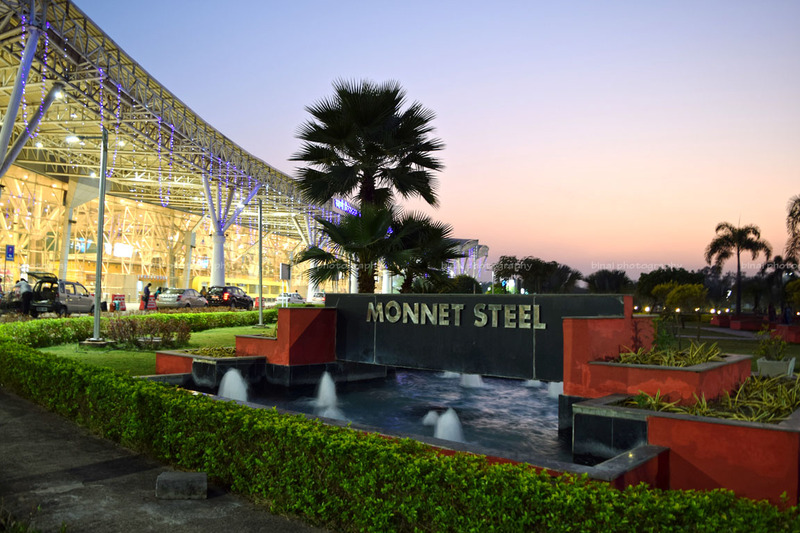 It appeared that the number of passengers boarding from Raipur wasn't high, but the aircraft was more or less full. I got into the aircraft by 2018hrs - since most passengers had already settled, boarding didn't take a lot of time. The first thing that stuck me as I sat down was - its damn tight! Hardly any leg room, and I felt claustrophobic sitting there. 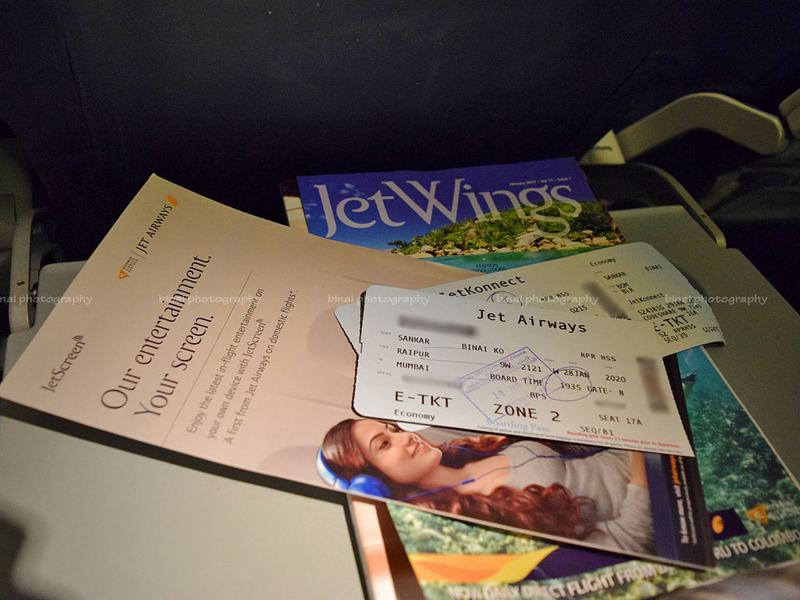 The seats had individual PTVs, which just showed a "Thanks for Flying Jet Airways" message. A Boarding Completed announcement was made at 2022hrs. The doors weren't closed and armed until 2038hrs due to some pending paper works. In command of this flight was Captain Janak Dev and First Officer Varun Kumar. Cabin crew were led by Jitendra Kumar. Mr Sandup and Ms Hoeineichong were taking care of the zone I was seated in. We were pushed back at 2039hrs. The captain came on the PA a little after we were pushed back and informed that we'd have a slight delay in commencing taxi due to congestion on the apron, and added that the taxi would take about 10 minutes! Soon after this, the safety demonstration was performed. We commenced taxi at 2043hrs, and taxied through the runway to the 24 end. We reached the 24 end of the runway by 2047hrs, and turned around on the turnpad to line up for take-off. We were airborne by 2049hrs. 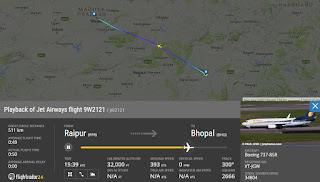 We took off to the South west before turning around North west and setting course to Bhopal. The seatbelt sign was turned off by 2053hrs, and the onboard service started right after. 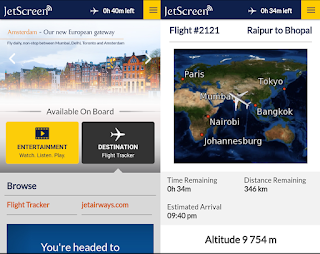 Along with the seatbelt switched off announcement, they also announced that JetScreen was enabled, and passengers could watch their favorite shows or movies using the AirTime app. A small information card about using the JetScreen was kept in the seat pocket as well. 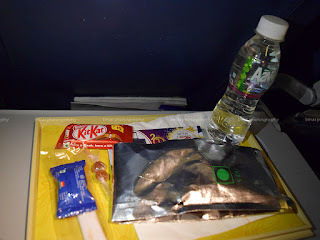 My boarding cards, JetWings and the JetScreen manual..
No trolleys were used for the service, instead the Flight Attendants brought plastic crates filled with sandwiches. There were no options - Just the Veg sandwich was available, while another FA brought a crate with water bottles. 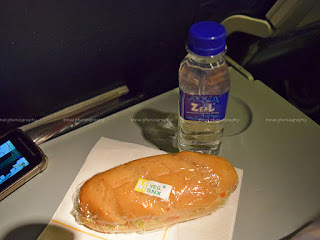 The sandwiches were handed out quickly - no trays were used, just the sandwich and a bottle of water handed out to passengers à la LCC style. It was a routine coleslaw sandwich, typical of Jet Airways! I finished the sandwich in no time, and opted to watch a movie on JetScreen. I opted a Bollywood remake of a famous Malayalam movie - for the simple reason that I needn't mind about continuity or missing watching the entire movie. The movie kept me engaged for the rest of the flight. The crew were very proactive in helping passengers - calls were responded in no time. The seatbelt sign was back on at 2125hrs. 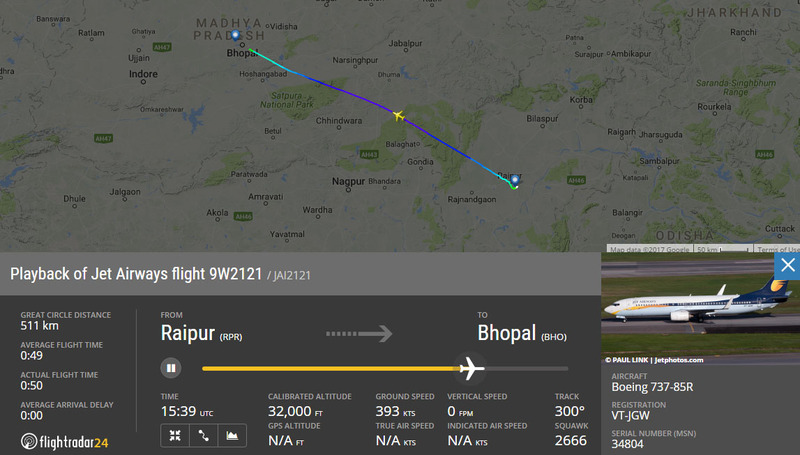 We touched down on Runway 30 of Bhopal's Raja Bhog International Airport at 2139hrs. We docked at a contact stand by 2147hrs. Disembarking completed by 2152hrs. Snack served in the Raipur-Bhopal sector..
An army of housekeeping professional and security staff barged in. 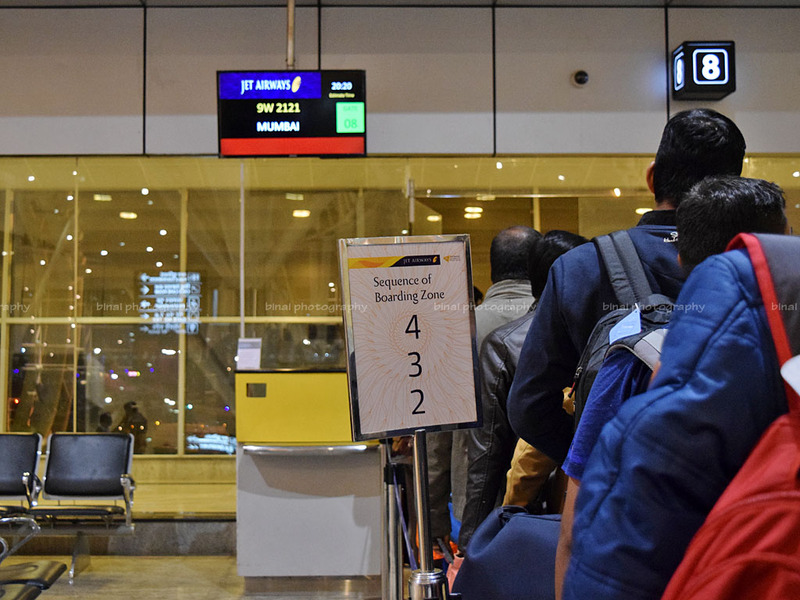 While two personnel checked boarding cards, two more security staff went about identifying hand baggage. Housekeeping personnel were quick in clearing the aircraft. Seat belts were kept in the characteristic "X" pattern, and they went about ensuring all seat pockets had safety cards and magazines. The security personnel were a little confused as they went about checking - they lacked co-ordination and ended up duplicating each other's work. I was so tired sitting there at those tight seats that I got up and had a walk till the aft galley, which was being prepared for the service in the next sector. Boarding for the next sector commenced at 2200hrs. Boarding for this sector was real quick. We were done by 2211hrs. The doors were armed by 2213hrs, and we were pushed back at 2216hrs. A quick safety demo was done, and we commenced taxi by 2220hrs. We entered the runway, headed to the 30 end, turned around and lined up for takeoff by 2225hrs. We were airborne by 2227hrs. The seatbelt sign was turned off by 2233hrs, and the food trolleys rolled out in no time. Since this was another short sector, I had no expectations of a dinner service. As expected, baked rolls were being served. The seats.. taken during transit at Bhopal.. The trolley reached my seat quickly - two options were given: Veg or Chicken. The roll was served on tray, along with Jet Airways' Award Winning Dessert - the "quintessential" KitKat chocolate-covered wafer bar confection, and the hot beverage kit, consisting of dairy whitener, sugar and a stirrer. The imli candy mustn't be missed as well. Unlike my previous experiences, the roll wasn't over heated this time, and it didn't stick on to the cover. The filling was mild, and not very spice laden. Soon later, a round of beverage service was done. I opted for a coffee, which was good. I was engrossed in the movie that I was watching on JetScreen most of the time. Seatbelt sign was turned on at 2326hrs. We were already holding by now. As we prepared to land, the PTVs played a promotional video about Etihad Partners, explaining their FFPs and flying comfort. The aircraft was equipped with PTVs as well as the WiFi based Jet Screen. The hold was short, and we aligned to ILS and entered short finals in no time. I got quite nostalgic as we flew over Navi Mumbai, my home for almost 10 years. We touched down on Runway 27 at 2346hrs. Terminal 1 (A & C) appeared quite deserted - I was actually shocked by the complete absence of IndiGo aircrafts at any of the contact stands. It was a long taxi to enter the apron of the new Terminal 2. The international side was dominated by heavies - I felt quite excited spotting widebodies from Jet Airways and Air India. We made a couple of brief halts during taxi, making me think we might just dock at remote gate, but that wasn't the case. We docked at a contact stand by 2357hrs. Disembarkation began in no time, and I was out of the aircraft by 0004hrs. FR24 track of BHO-BOM sector.. This was my 14th flight on Jet Airways (discounting three flights operated on the JetLite AOP), and the 4th on a Jet Airways Boeing 738. Majority of my flights with Jet Airways were on their ATRs, which are aplenty down south. 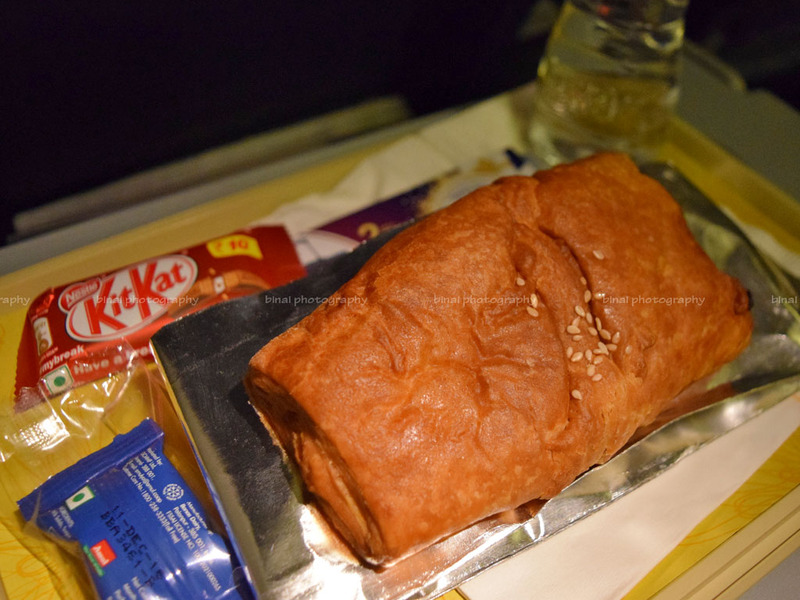 And, except on flight on the 9W B738, all others were disappointment in terms of catering. This flight was disappointment - terrible leg room and very claustrophobic seats. The Full Service Carrier image that Jet tries to portray doesn't really gel well with the very apparent cost cutting they do in their meal service - a small roll with a chocolate hardly makes a meal! Coming to the meal, the product served tasted good. I understand that the catering was done by Taj-SATS, the leader in the industry, beyond doubt. The crew were great - very polite and helpful. The ground staff messed up quite a lot during the transit check. Housekeeping was perfect. JetScreen is an awesome addition - but it needs to be supplemented with charging points on board. 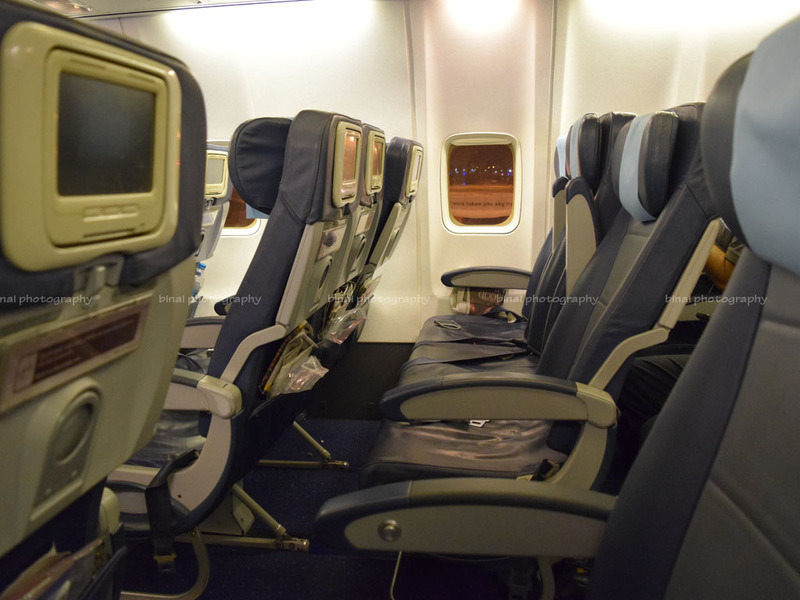 Overall, an average flight, more so due to the seating.